Teacher Bits and Bobs: Holiday Crafts Galore! Are your kids as CRAZY excited as mine are?? Whooeee...Can I survive 8 more teaching days?? I am seriously having to psyche myself up for this, and the only things keeping me sane are: A-Magic Elf, and B-the promise of the calmness and maturity that January will bring to my chitlins (fingers crossed!). I wanted to share the potpourri of crafts that I have made with my students over the years...Here goes! So then, we made the handprint tree with fingerprint lights. I LOVED these! I especially loved going with Lindsay and having to use the saw at Home Depot to cut the dowels. Boy, were we sweating by the end of that task every year!! ...this year we are making these wooden plaques! I like how old-fashioned they look and I like that the kids have a lot of work to do on them. My favorite part, of course, is the Mod Podged snowman. SWOON! I wish I could mod podge the WHOLE WORLD! I also make every year for my students a simple ornament with their picture on a die cut shape using Ellison dies. While I'm at it, I make my daughters one for our tree and for the 2 Grandma's trees. I have been making these since Sarah was only a year old, so we have them ALL OVER our tree and every year, I get a little misty eyed when I see the ones of my daughters when they were babies! Well, there you go! 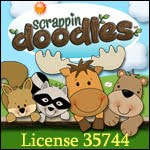 A variety of Holiday Crafts for your viewing pleasure!! BTW, thank you Friends SO MUCH for purchasing my Winter Words packet! I am still in denial that I have to go back on January 2nd, which means I have GOT to get all my ducks in a row next week for the week we get back! YIKES!! 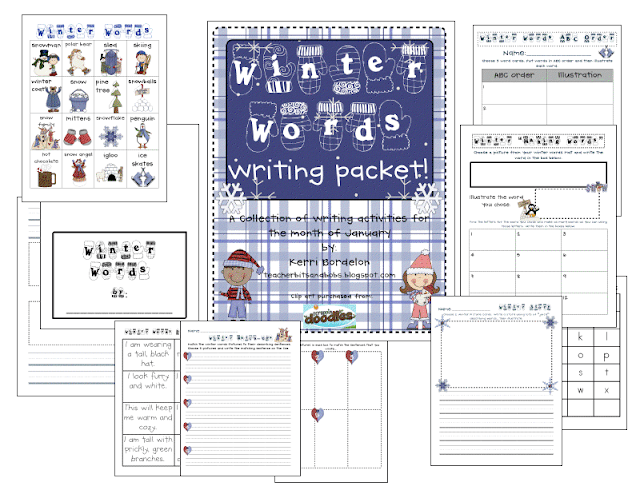 You can get your Winter Words Writing Pack ready to go for January by clicking on the picture below!! P.S. Does the title of our blog look pixilated when you view it?? For some reason it does on my computer at home and it is making me BUG OUT!! I'd love some comments on how it looks your end! Love all the crafts, and the blog title looks normal from here! Looks fine on my end! Love the tiles. Cute, cute. Your blog title does look a bit blurry on my end. I'm having blog title issues recently too. My font title won't display the proper font ( it defaults to a generic italic) at least on my Mac. I can't check a PC view because at school all blogs are blocked. I LOVE the hand Christmas tree with the fingerpaint lights. LOVE! I guess your title looks a little blurry but that's also because I just took out my contacts and I'm wearing old glasses. So don't listen to me. great ideas! The banner does look low-res. Just up your resolution or decrease your size and that should help! I love all of the ideas! Title looks good to me! Great ideas. We are loving our class elf! I am awarding you the Sunshine Award. 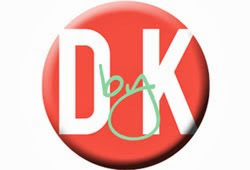 Stop by my blog to check it out! It looked really tiny yesterday (I think)...the days are all running together as the craziness in the classroom continues... But today it looks great! One Room Schoolhouse and TPT SALE!! Holiday Survival and New Year Cheer! WInter Games and Long TIme, No Blog!! Cozy Snowman Cuteness and family wreath letter! ANOTHER Magic Elf Freebie and more Holiday art! My blog has gone INSANE! !